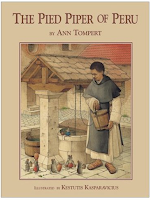 There is also a lovely coloring page of St. Martin in Fenestrae Fidei: A Coloring Companion for Catholic Mosaic. 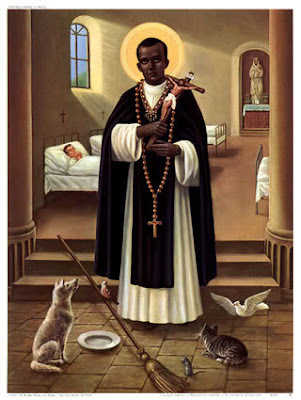 Most humble, St. Martin de Porres, whose burning charity embraced not only the needy brethren, but also the very animals in the field. Splendid example of charity, we hail thee and invoke thee, from the high throne which you now occupy. Deign to listen to the supplications of your brethren, that by imitating your virtues, we may live contented in that state in which God has placed us, and carrying with strength and courage our cross, we may follow the footsteps of our Blessed Redeemer and His Most Afflicted Mother, that, at last,we may reach the kingdom of Heaven, through the merits of our Lord Jesus Christ. Amen. 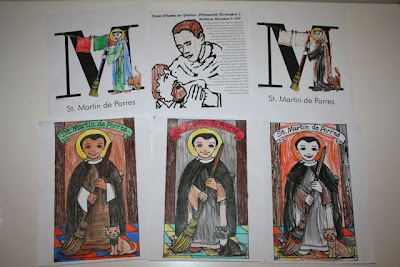 Oh, this is the most beautiful Martin de Porres celebration! I'll be linking to it, so next year, we can do it up with more fanfare. :) How very sweet it all is! Oh, I'm Veronica, the gal behind Paper Dali. Would you mind if I borrow your pic (linking to you, of course) to show my paper dali at play? Please let me know by replying at updates4paperdali@gmail.com. that loooks like so much fun. I tried to look for Catholic Artwork's Faith Finders CD on their website but there so many...which one were you using for all these cute saints images? thanks!!! Thank you both!! 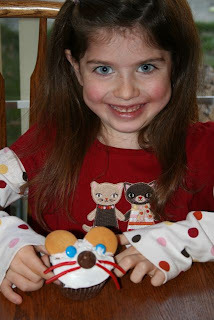 And Thank you Veronica for providing the beautiful paper dolls!! 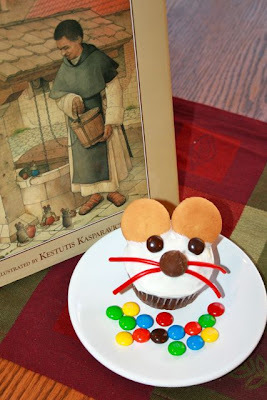 I love your blog, but I never comment but felt like I needed to share my special devotion to St. Martin. As a young girl I had seizures and the doctors did not understand why. I had cat scans, MRI's , blood work, you name it and yet they could not figure out why. They were afraid that if they did not find the source I would not make it. My mom prayed to St. Martin and I dressed like him. I am in my 30's and have never had a seizure. To this day he holds a special place in my heart and I run to him when I feel hope is lost. 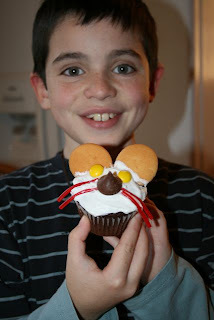 Thank you so much for posting on his special day. 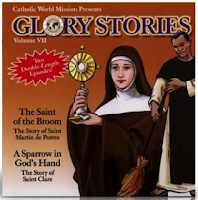 Who doesn't love Glory Stories!??!! They are awesome and so beautifully done. Most of the stories bring tears to my eyes! We don't have the St. Clare/St. Martin one, I'll have to get that one! Fantastic post as always! I had to bookmark this page. 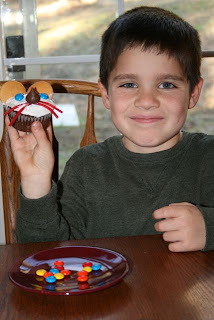 There is just so many great ideas and links! 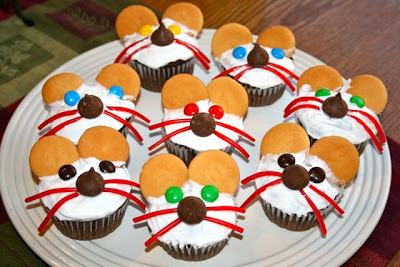 And I love those mice cupcakes! How cute!! Thanks so much for sharing. Hi. I am a Catholic priest in Yazoo City, Mississippi. Our theme for Lent this year is "Journeying with the saints during Lent." 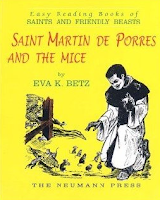 I worked as a lay missionary in Ecuador for three years, so St. Martin de Porres is one of the saints who is near and dear to my heart. 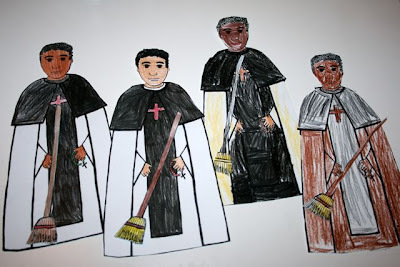 We are starting off with St. Martin de Porres at the first reflection we will have at our Wednesday soup dinners during Lent. 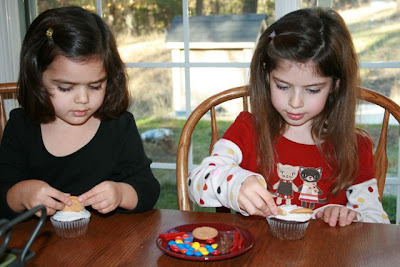 You gave us some great ideas for activities to have with our kids. 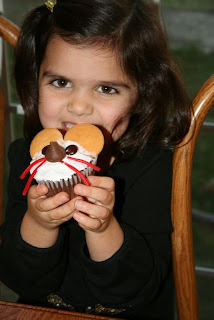 The paper dolls and the cupcakes are great ideas. We are ordering the story book. Thanks so much!